Heavenly Holidays on Hopgood is a well maintained light, open and airy modern family beach home in quiet 'pocket' sharing boundary with local primary school. Walking distance to café strip and shops, IGA super market and Barwon River and swimming beaches Barwon Heads and Thirteen Beach Golf Clubs are close by. Barwon Heads Golf Club is in walking distance. 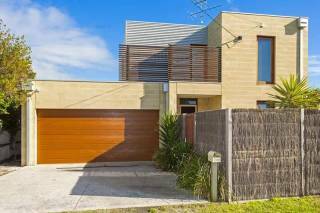 It's a short distance to surf beaches and Ocean Grove and 30 minutes to City of Greater Geelong. It's a short drive to the historic town of Queenscliff, Pt. Lonsdale, Geelong, Torquay, Portarlington olive groves and wineries, St. Leonards, the Bellarine coastal drive, Ocean Grove Pool complex and the marvellous Geelong Adventure Park - great for the kids and loads of fun. Just a one hour drive to Lorne via the Great Ocean Road. A great location to enjoy exploring the Bellarine Peninsula and all its treasures, or just staying put in Heavenly Holidays on Hopgood and enjoying your idealic holiday location. Heavenly Holidays on Hopgood accommodates up to 6 - in 3 bedrooms, bedroom 1 has a queen bed, bedroom 2 has a queen bed and the 3rd. bedroom has 2 singles beds. 2 bathrooms and 2 toilets service the bedrooms. There's 3 living spaces separated by open-plan kitchen with electric hotplates and wall oven, fridge, dish washer and microwave oven. For your entertainment there's free to air TV in two living areas with a stereo and DVD. Laundry has an automatic washing machine and outside clothes line. Outside eating area with gas barbeque. Back yard open to primary school playground and there's access to off-street parking. No garage access. 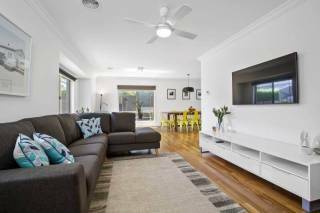 Barwon Grove Holiday Rentals (BGHR) offer a range of properties for rental in Barwon Heads and Ocean Grove regions. We have identified a standard of property to represent and these are shown in detail on our website on a property by property basis. We work with the owners of properties presented to provide you with the best choice for your holiday destination. Thank you for your assistance. For further information regarding this policy, please contact us for further clarification. Please call us at any time if you have any queries during your stay or require information about the many treasures located on the Bellarine. We are available 7 days per week, 7am to 10 pm.